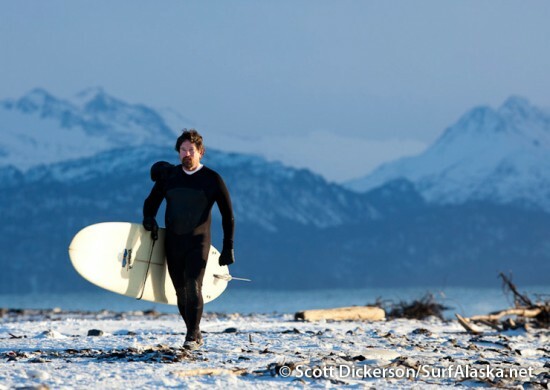 Alaskan surfer, Ty Gates, walking out of a winter scene. 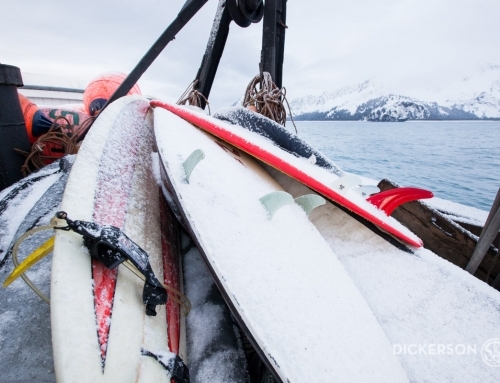 Alaskan surfer Jake Bell runs in place on a snow covered beach to warm up his frozen feet mid session. 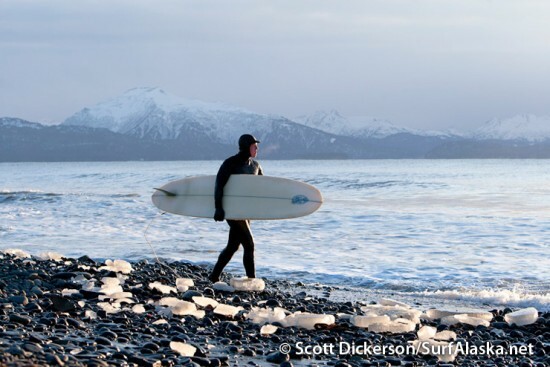 Alaskan surfer, Jake Bowler, walks pas blocks of ice littering the beach. 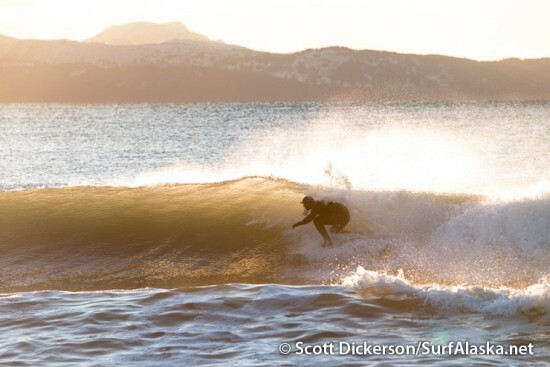 Kyle Kornelis surfing an Alaskan sunset session. Tim Bowler settled in and cruising after sunset. OK, that first photo for the 28th… I am now convinced that I’m going to make it down from Anchorage so I can have a shot. That is sweet. When I’m finished here I’m going to google for squid lids and just convince myself that I can handle December temps in a 4/3 suit. Robert – You are not alone. That first photo is cruelty to animals. Snakey McFadesalot there thinks we might have something brewing up for Monday. Doesn’t sound like anything worth making the long drive for yet though. Squid lids? I’ve never heard of that, or those? I used a ratty 4/3 for several years, it was cold, I would shake like a wild man with the early stages of hypothermia but no harm done. Or, at least not that I’m aware of . 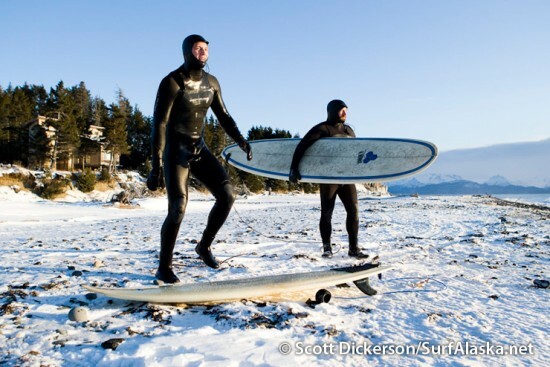 . .
NWS Jan12, maybe blown out but waves + daylight tide + balmy double digits…..slough-sandbar-paddle-battle! I haven’t looked at the weather lately, been too busy searching for a wood stove! brrr. I hope you are right though. I see. 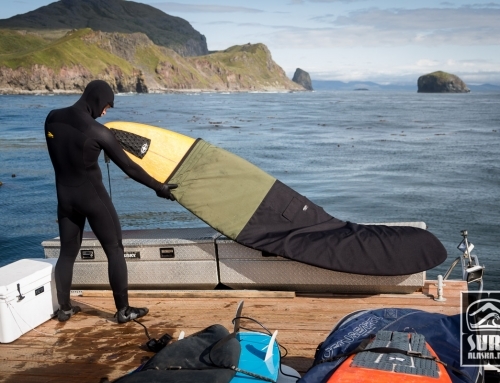 With my 4/3 suite I used to wear an o’neil heatshirt thing that had a built in hood, sounds about like what you are describing, except mine is not neoprene, just some kind of polyester. If you make it down here before your goods arrive let me know and I can loan you that heatshirt. Cool website! 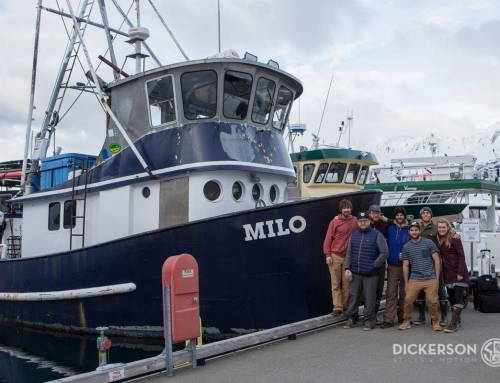 Those are some nice pics and the backdrop is nice. 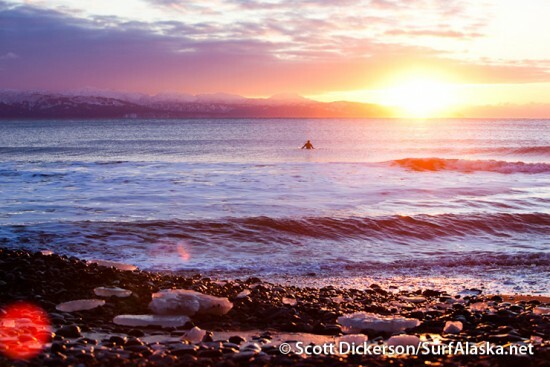 I would love to make it up to Alaska and surf someday. Thanks Chris. You are welcome anytime. U guys are crazy! I was just thinking how cold that water is here in North FL. haha you guys would laugh at it 64 degrees. 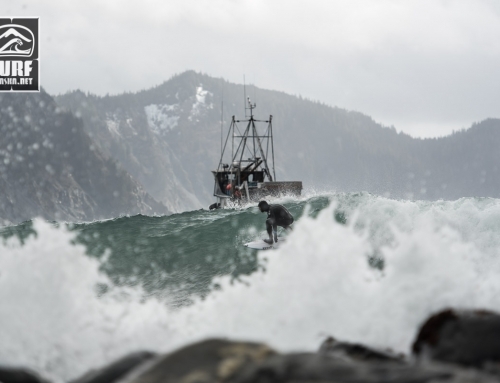 Where are the big point breaks with no one on them? There has to be tons of setups like that there? Hi Paul. I’ll bet you’d be crazy if you lived here too. 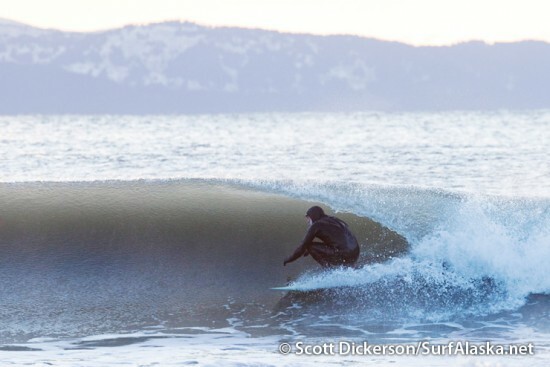 This winter we had a real nice sandbar that these waves were forming on. The currents and tides changed it’s shape after a while and we haven’t had waves like this there since January. 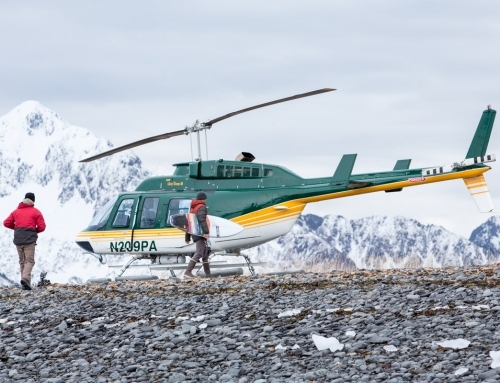 Alaska is a big place, certainly lots of great unknown breaks to go discover! Thanks for the well thought article. I just want to remind everyone that skin cancer levels are rising so please get a rash guard to protect you and your kids this Summer.